Over the last 60 years the Davidson campus has hosted hundreds of pop music concerts to celebrate Homecoming, Spring Frolics, Mid-Winters Dances, and Patterson Court reveries. Many were sponsored by the Union Board (formed in 1956), while others were brought by various coordinating committees and campus groups. Acts ranged from 1940’s era Big Bands to 80’s Hair Bands, to Punk Rockers and introspective Indie Poppers. Davidson has also been a venue for soon-to-be-huge bands early in their careers. English rock band The Police (fronted by Sting) performed in 1979-80, only two years after they formed in 1977. The Dave Matthews Band (DMB) performed here twice. 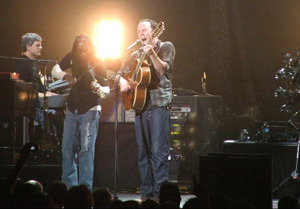 The second time was for a mass audience in 2002-03—by that time DMB was a huge success. But, DMB first played Davidson in 1992-93, before the release of their first album (Remember Two Things, November 9, 1993). The show was sponsored by Patterson Court, but was shut down early, after only two hours, when local Davidson residents and the police called President Kuykendall to complain about the noise. 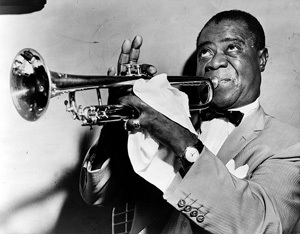 We were able to draw world-renowned American jazz trumpeter and singer Louis Armstrong to perform four times between 1953 and 1960. The Glenn Miller Band, Tommy Dorsey, and Charlie Spivak also played Davidson in the 1940’s and 50’s. During the 60’s through the 80’s, Davidson saw performances from rock ’n’ roll icons such as The Righteous Brothers, Blue Oyster Cult, The Bangles, and REM, as well as shows by blues and jazz artists like Muddy Waters, Duke Ellington, Earl Scruggs, and Wynton Marsalis. From the 1990’s through today, Davidson has seen a diverse array of indie, funk, jam band, and mainstream acts including the Indigo Girls, George Clinton and the P-funk All-Stars, The Counting Crows, Phish, Widespread Panic, Third Eye Blind, and Bob Dylan. So, Davidsonians and music lovers rejoice! And look forward to the next half-century of good music.